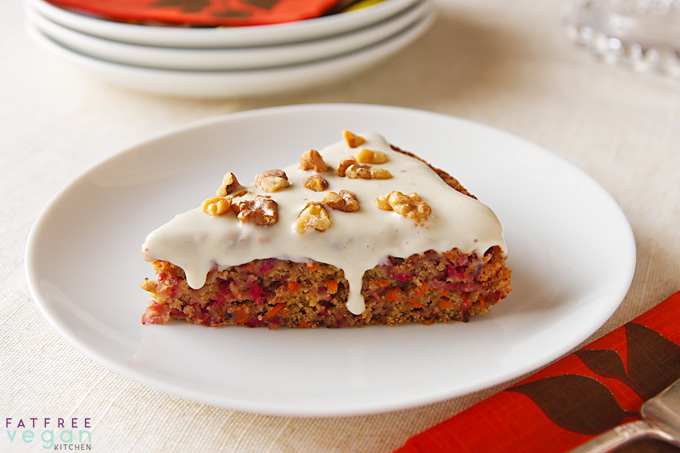 Cranberries add a tangy, fresh flavor while carrots provide sweetness in this colorful, vegan Cranberry-Carrot Cake. Perfect for Thanksgiving or Christmas. Six years ago, I was honored to work with Nava Atlas, taking the photos for her book Vegan Holiday Kitchen. It was a gorgeous hard-backed book, and I’m happy to announce it’s just come out in an equally beautiful paperback version, with full-color photographs on heavy, high-quality paper. To celebrate, I asked Nava if I could post one of her recipes from the book, and she said yes. I’ve also begun giving away some of the copies that the publisher sent me, and I’ll tell you more about that in a moment. 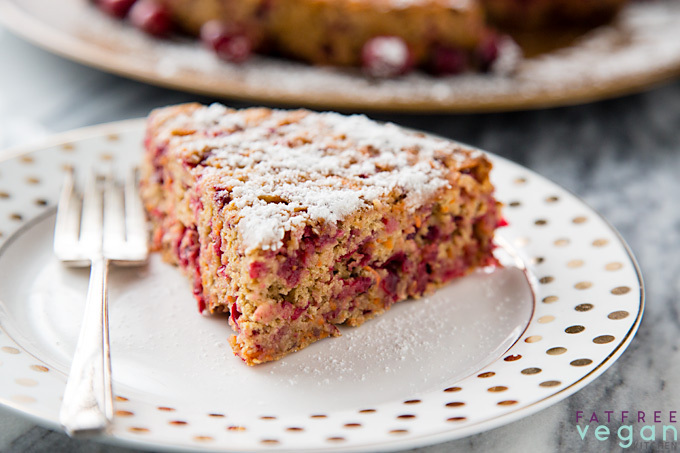 For now, let me tell you about this delicious cranberry-carrot cake. When I first made Nava’s Cranberry-Carrot Cake with Vegan Maple-Cream Cheese Frosting to photograph for the book, I followed her instructions exactly and topped it with the vegan cream cheese frosting and walnuts you see in these first photos. I also used the 2 tablespoons of vegetable oil the recipe called for because when I’m taking photos of someone else’s recipes, I’m obligated to show them exactly as written. The cake and the cream cheese frosting were both delicious, but I knew that the cake was so good that it didn’t really need the frosting–it just looked fancier with it. So I decided to try my hand at making the cake without oil and without the frosting, and it was just as delicious (and easier) than the original recipe. I used aquafaba (liquid from canned chickpeas) instead of oil and baked it just a touch longer than the original recipe required. Instead of frosting, I sprinkled the top with powdered sugar. Now, about that giveaway. 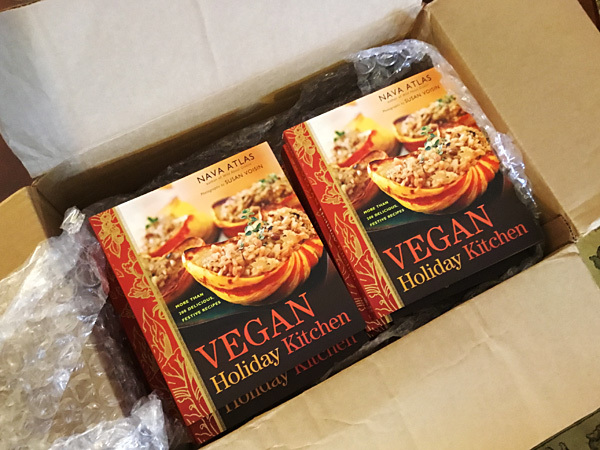 Last week I gave my newsletter subscribers a chance to win 2 copies of Vegan Holiday Kitchen. In the end, there were so many entrants that I gave away 3 to lucky winners Jodi, Joanna, and Martha. This time, I want everyone to have a chance to win. I’m going to give away 3 more copies, and you can enter by visiting my page on Facebook, subscribing to my newsletter, following me on Instagram, or simply leaving me a comment if you already do all of those things (or just don’t want to!) 🙂 Each option gives you another chance to win, but…YOU MUST USE THE FORM BELOW TO ENTER (your email address and other information will be kept private). I am sorry but I am unable to mail to addresses outside the continental U.S.
Sorry—The contest ended at midnight EST, Monday, Nov. 20, and the winners are announced above. Thanks to all who participated. This cake makes a nice change from pumpkin pie for Thanksgiving, and its beautiful colors are perfect for a festive Christmas dessert. I adapted the recipe from Vegan Holiday Kitchen by Nava Atlas, eliminating the small amount of oil in the original. Use her cream cheese frosting, if you like, or simply sprinkle with confectioners sugar for a very low-fat dessert. Place the cranberries in a food processor fitted with the blade and pulse on and off until evenly and finely chopped. Transfer to a bowl. Add the sugar, stir well, and set aside. In a large mixing bowl, combine the flour, flaxseeds, baking powder, baking soda, ginger, and cinnamon. Stir to combine thoroughly. Make a well in the center and add the applesauce, syrup, aquafaba/plant milk, and vanilla. Stir until the wet and dry ingredients are completely combined, but don’t over mix. 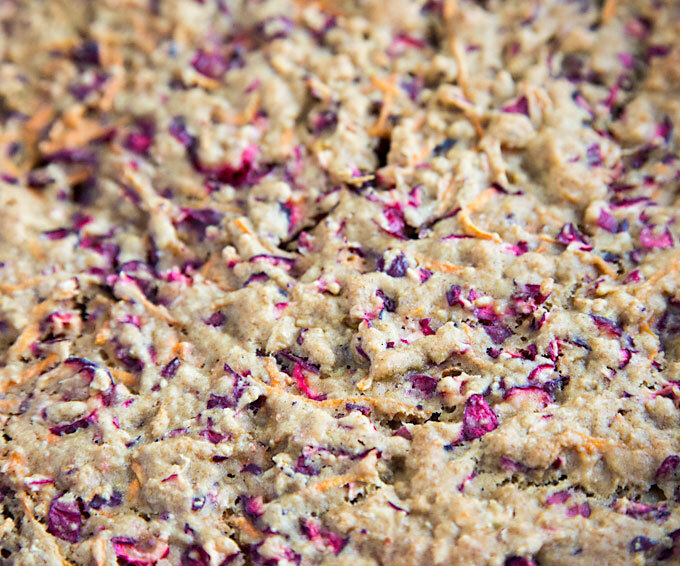 Stir the cranberries and carrots into the batter. Pour into a 9-inch round silicone cake pan. or lightly oiled springform pan (see headnote). Bake for 35 to 40 minutes, or until a knife inserted into the center comes out clean. If using the walnuts, toast them in a small dry skillet over medium heat until they brown lightly. Once the cake has cooled to room temperature, release from the pan if you’ve used a springform or other easy-to-release pan and spread the frosting over the top evenly, allowing it to drip over the sides. Otherwise, leave the cake in the pan and simply frost the top. Sprinkle evenly with the optional walnuts, then cut into wedges to serve. Combine the ingredients in a food processor fitted with the metal blade. Process until creamy and smooth. Use a flexible cake spatula to remove from the container. Spread on cakes or cupcakes once they’ve cooled to room temperature. Nutritional information does not include frosting or walnuts. If you’re looking for more dishes to fill out your holiday menu, please check out my Thanksgiving Recipes. This looks fantastic! I will be trying this one out. This looks scrumptious. I will have to track down some organic cranberries and give it a try! I am also very interested in the cookbook drawing. Thank you for your sharing and Happy Thanksgiving! So happy to hear you will be spending it with your daughter. I already subscript to your newsletter. This looks like something my husband would love! I can’t wait to try it. This recipe looks amazing! I actually prefer my cakes, when I have them, without icing of any kind. Powdered sugar is fine, and it looks so pretty sprinkled on this cake. Thank you Susan and have a wonderful Thanksgiving with D! For sure it will be one that you will remember and talk about for quite some time! Thank you for the cranberry carrot cake recipe. I️ was looking for something seasonal, but heal h go serve for Thanksgiving. Am excited to try it. Just found you for the first time today. Guess it is my luck day. Great recipes ! Thank you. Hi, the cake sounds and looks yummy! Do you know how i could successfully make it gluten free? My roommate has recently gone vegan and I am so excited to keep trying my hand at recipes for both of us! I am glad I found your blog and your other resources on FB. Haven’t looked you up on Twitter. I have used a lot of your recipes and the family has enjoyed them. If you’ll enter me in your contest I would appreciate it, especially if I win a copy. I love the idea of cranberry/carrot as an option to the usual cranberry/orange and it does look beautiful. Although I’m not sure which form I’m supposed to be using. I’d like to make this today (Tuesday) to serve in two days on Thanksgiving. Do you think it would keep? I wouldn’t frost it. It will keep but it will become more moist the longer you keep it. If you plan to use powdered sugar, don’t sprinkle it on until you’re serving it. Maria, please don’t do it! Lol The cranberries form a large part of the liquid in the recipe when they mix with the sugar. Without them, there won’t be enough moisture. I’m sure with your baking skills you can fool around with the recipe and add liquid to make it work, and maybe just add sugar to taste, but most people would have better luck just sticking to the recipe. This was delicious. Very moist and flavorful. I chose not to use frosting and added a little pure maple syrup on my piece when I ate it. Hi Susan, I made this for Thanksgiving yesterday, and it is amazing! Easy to make, and I love that is a relatively healthy dessert. My in-laws are gluten-free, so I used Bob’s Red Mill Gluten-free baking flour. Thank you! I’m so glad to hear it works with gluten free flour! I love your recipes; they’re easy to use and are delicious! 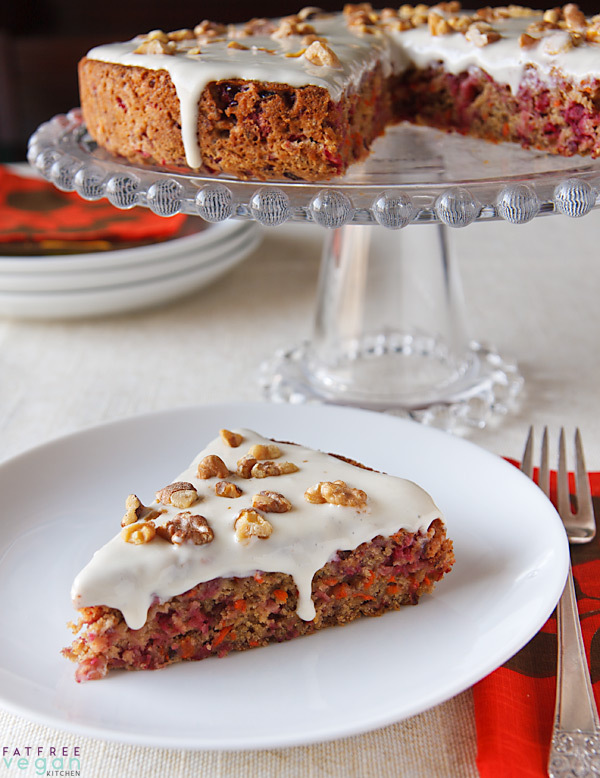 Looking forward to trying this carrot/cranberry cake recipe. Thank you so much for sharing your wonderful creations. Keep up the great work of encouraging more people to eat the healthy way. I tried both the cranberry carrot cake and the Thanksgiving loaf, and while they were tasty, they were both very “wet”, even when I left them in the oven longer. I made each recipe three times, following directions, and no improvement. I have found this to be true with other fat free vegan baking. No one is complaining; everyone enjoys the results, but I would like to see some improvement. I am kind of obsessed with this cake! I planned to make it at Thanksgiving, but didn’t get to it. Since I had all the ingredients I made it to take to a work potluck. It really is beautiful with the colorful carrots and cranberries! I think I prefer it without the frosting; it’s just sweet enough. Hubby prefers the frosted version. I will be making this again! I accidentally picked up whole wheat flour instead of whole wheat pastry flour. I have no other flour on hand. Can I use it instead or do I need to wait until I can exchange for pastry flour instead? I would use it. Pastry flour makes cakes a little lighter, but you probably won’t notice the difference. Wow, looks really cool. I mean, probably tastes cool as well. I’ll take it haha thanks for sharing! Do you think I could put the walnuts IN the cake? I don’t plan on using any sort of frosting but love the idea of walnuts, orange and cranberry. Would it need a bit more moisture? Such a great idea, yum! This cake is prettier then it taste. Was very dense – not good. Why is it that your recipes and ALL the Forks over Knives have the same 3 1/2 star ratings….seems strange they are all the same. 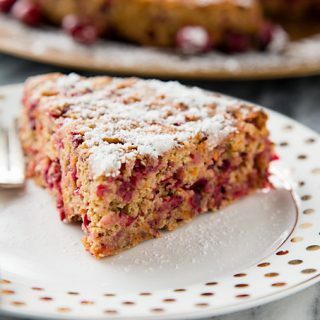 I haven’t tried this cranberry cake but will soon. It looks awesome. Love this recipe. Thanks for sharing. I’m wondering if there would be a way to reduce the sugar in the cake? Maybe replace the maple syrup with more applesauce? I want to use the icing but don’t want it too sweet. I LOVE THIS CAKE!!!! I’ve made it at least four times and am snacking on it for breakfast this morning. The carrot pieces almost make it taste like nuts which seem decadent. I put a simple icing on mine and put walnut pieces on the top. This is one of my favorite recipes out there. Thank you so much!! For some reason I can’t rate this on my laptop, but I rate it five stars! I’ve already commented about how much I love this cake. I recently shared the recipe with a friend who made it and she and her guests loved it too. I made it again today and made an orange icing with some orange zest and orange juice. It’s the perfect topping for this delicious cake!